Jason Ruth knows about the old days, the really old days, when the Bay surrendered a bounty of oysters so vast that words could hardly describe it. That’s when Captain John Smith crossed an ocean to settle the colony of Jamestown in the New World. When the 17th century English explorer saw the Chesapeake Bay, he described oysters lying “thick as stones” atop each other. Ruth, who grew up on and near the Bay, knows that story—knows, too, that those days are long gone. Development, pollution and commerce have guaranteed that oysters no longer lie thick as stones in the nation’s largest estuary. But the tasty bivalve remains, and may be staging a small comeback in a segment of the Bay—thanks, in part, to the U.S. Fish and Wildlife Service (Service). For several years, it has been helping local communities create new oyster beds as well as restore some stretches of shoreline. That’s good economic news for Ruth and the watermen who make their living on the bay. Conservation, they know, can be good for business. But the boy and Bay were linked. When he was 13, Ruth got a job at Harris Seafood Company. It had struggled through bust, surged through boom. Founded decades ago, the seafood packer once shucked 1,900 gallons of oysters in one day. He started, literally, on the ground floor: young Ruth shoveled and packed oysters. Over time, he assumed other responsibilities, learning the seafood business. In 2004, he bought the company. His time at the packing house gave Ruth a firsthand look at how closely oysters and the environment are linked. An industry already under pressure from over-harvesting and pollution suffered another large setback in the 1980s when dermo and MSX struck oyster beds. The diseases decimated oyster populations. One by one, the seafood-packing houses on Kent Island closed until only Ruth’s remained. Today, it’s the sole full-time oyster-shucking house left in Maryland, employing 57 people while supporting 250 watermen. 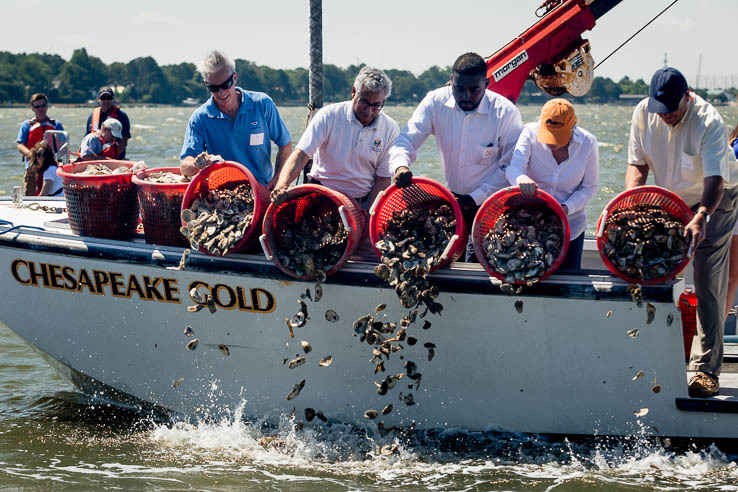 The year-round business generates between $25 and $30 million annually—no small drop in an economic bucket that has shrunk along with the oyster industry’s fortunes. 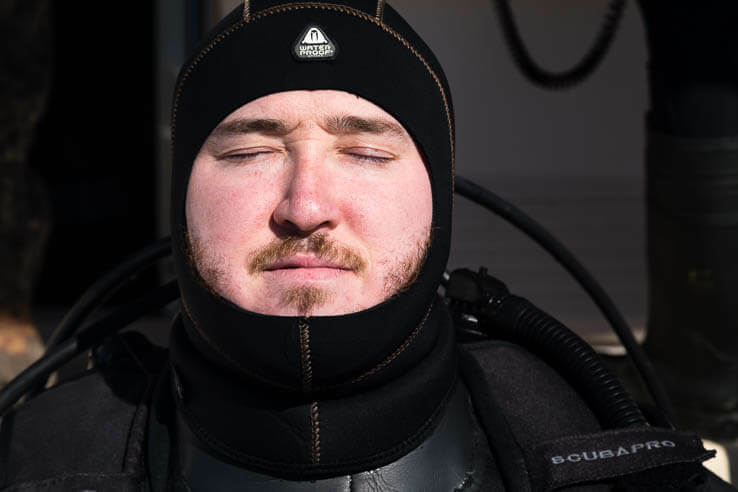 The value of oysters wasn’t lost on David Sutherland, a biologist in the Service’s Coastal Program. For the last few years, he has been working with the Chesapeake Bay Environmental Center (CBEC) to recover oysters and restore shoreline on Kent Island and the surrounding area. It’s important work. Having healthy oysters has profound implications for the environment as well as the wallet: one oyster can filter 50 gallons of water each day. Thriving oysters means cleaner water. One oyster project: placing reef balls in a 287-acre stretch of the Bay to promote the bivalves’ growth. Calling the structures “balls” is a bit misleading: Each is shaped vaguely like a pine cone, with an opening at the top and along the sides that allow water to whoosh through. Built of concrete, the balls vary from two to six feet tall, Sutherland said. Some “definitely need to be moved by crane,” he said. The Service helped prepare reef balls that were placed in an oyster sanctuary adjacent to CBEC. Scientists soaked them in containers filled with water and spat, or oyster larvae. The larvae attach to the concrete balls, which are placed in the Bay. As successive generations of spat mature into adult oysters, they form oyster reefs. The prognosis so far? “They’re doing great,” Sutherland said. 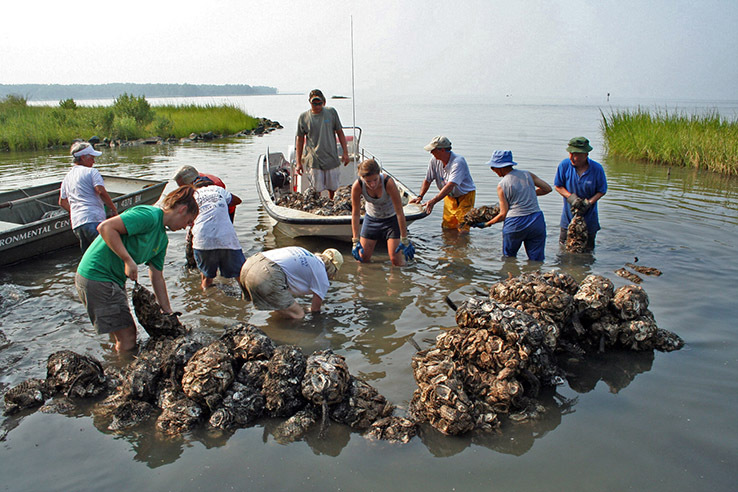 Another benefit of oysters: They help keep shorelines intact. 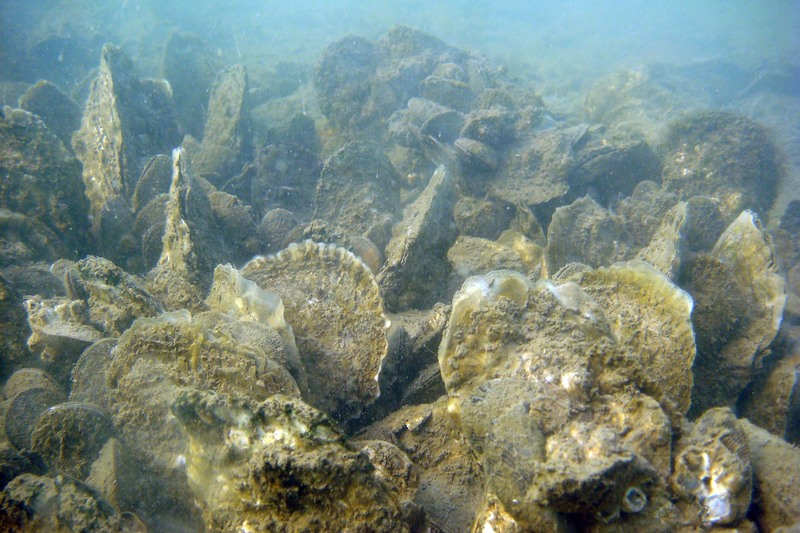 Oyster beds, scientists know, can reduce the force of waves hitting shore. The increase in sea levels, storm surges, and even shipping vessels in the bay have eroded some areas of shoreline. A thriving oyster population, Sutherland said, lessens that impact. Oyster beds also provide habitat for fish, crabs and other aquatic species. Foraging ducks, cormorants and other waterbirds thrive alongside oysters. Sutherland has a more personal reason for wanting a healthy oyster population, too. Vicki Paulas isn’t as enthusiastic about eating the bivalve as Sutherland. A native of northeast-Pennsylvania, she grew up eating pierogies, potato-filled dumplings—not shelled delicacies. But that hardly lessens her appreciation for oysters. She’s assistant director of CBEC, the nonprofit dedicated to improving the water quality and reducing habitat loss in the Chesapeake Bay watershed. Paulas has worked closely with the Service—Sutherland in particular—to improve oyster populations in the upper bay. Over the years, they’ve planted more than 10 million spat. 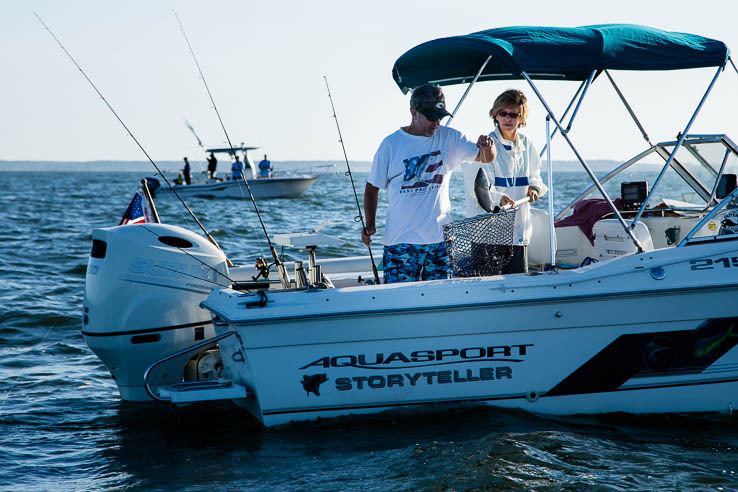 The Maryland Department of Natural Resources, Maryland Artificial Reef Initiative and the Coastal Conservation Association have helped. She’s enjoyed the time she’s spent with Sutherland. “The Fish and Wildlife Service, for us, has been the easiest to work with,” Paulas said. In 2013, Paulas was looking for new funding sources. She came up with the wild idea to establish an oyster lease and commercially grow oysters. From this sprung a partnership: a group comprising the CBEC, Harris Seafood, local watermen and the Service. CBEC had the spot—a site in its oyster sanctuary. 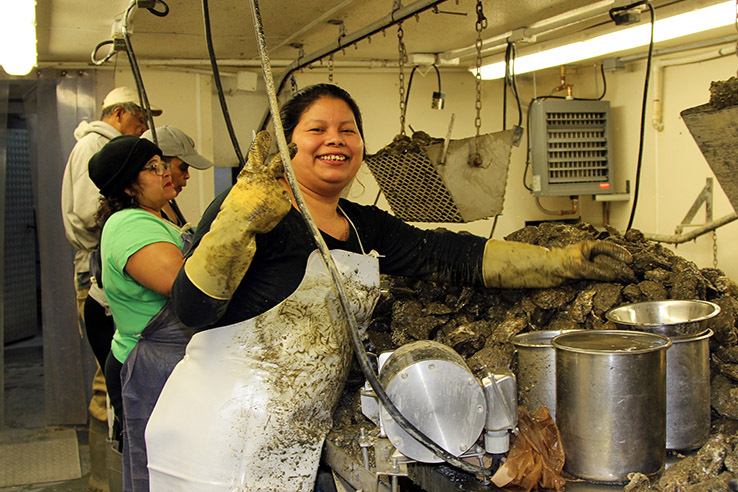 Harris Seafood had the spat—Ruth, the owner, bought 600,000 growing on oyster shells. Watermen had the muscle—they planted the spat-laded shells. The Service offered its coastal expertise. Ruth said he was happy to participate, as were the watermen who planted the spat. The oysters have grown up nicely and are almost ready for harvest, Paulas said. She predicts a harvest this fall—not the bounty that a long-ago visitor to the New World saw, but something to pique an oyster’s lover’s interest… and appetite. This article originally appeared on the U.S. Fish and Wildlife Service’s blog, Nature’s Good Neighbors. About Chris Eng - Chris Eng is a biologist with the U.S. Fish and Wildlife Service's Coastal Program, a voluntary conservation initiative that works with communities to restore and protect land and water resources important to them.